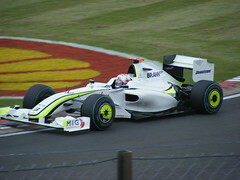 Unfortunately due to money shortages this year it was not the race I attended but Friday practice. Still better than nothing I say! As most of you are probably aware Friday is split into two sessions for the F1 cars, one in the morning and one in the afternoon. For the first session I decided to sit on the pit straight. One bonus of going on a Friday is that you are allowed access to many of the grandstands with a 'roving' ticket. 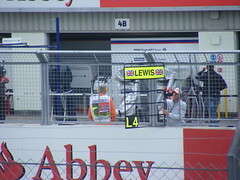 This meant I could sit right by the pit straight opposite the Ferrari and McLaren garages. For the second session I walked over to Abbey and was very impressed with the view there. Sitting on the straight is good to see the teams in action but nothing beats seeing the different ways drivers take a corner. Abbey provides some really great viewing and photograph opportunities, and I would thoroughly recommend it if you are planning to visit Silverstone for any racing event in the future.